We can setup as many rules as required to cover our various business scenarios involving how you want to recognize revenue. we have a seeded Accounting Rule named Immediate. This Accounting Rule is provided by Oracle. The only field we can modify here is the Period type, and we should ensure that the value here matches the Period type used by our Ledger. Below is the form used to do the Accounting Rules setup. Variable Schedule (formerly Variable Duration), this type allows you to later specify, during invoice data entry, the number of periods over which you want to recognize revenue. Daily Revenue Rate, All Periods, this type will use a daily revenue rate to calculate the precise amount of revenue for all periods whether it is full or partial. Use accounting rules of this type to meet strict revenue accounting standards which require accurate revenue recognition on a per-day basis. Daily Revenue Rate, Partial Periods, this type is a hybrid between Fixed Schedule and Daily Revenue Rate, All Periods. It will use a daily revenue rate to calculate the precise amount of revenue for the partial periods in the schedule, then prorate the revenue evenly across the full periods. This corresponds to the Period types you defined in Oracle General. Keep in mind that during data entry of the invoice lines, you can only use Accounting Rules that have the same Period as your Ledger. In addition to period types you've defined you can also pick Specific Date, which enables you to enter a specific date in the Date field in the Schedule section discussed below. Enter the number of periods you want this accounting rule to recognize revenue across. If you want to delay recognizing revenue, check this check box. When checked, invoices using this rule will have its revenue deferred to an unearned revenue account, and you must later use the Revenue Accounting Management (RAM) wizard to recognize the revenue. Invoices that use a Deferred Rule, will not appear in the Revenue Recognition Report, until Revenue is Scheduled via the Revenue Accounting process. Period: Specify the sequence of the Period starting with 1. Percent: Indicate the percent of the revenue you want to recognize in this period. 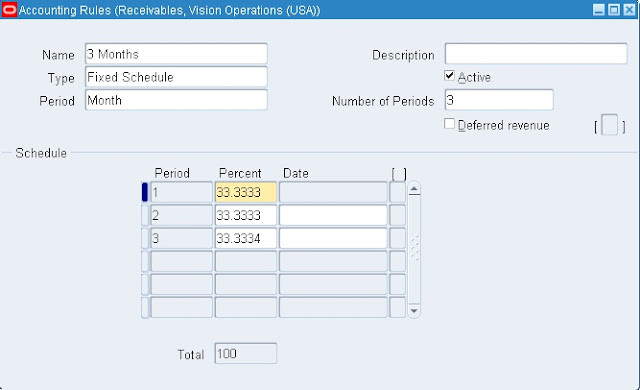 Total Percent across all periods must equal 100% for Fixed Schedule types. For Variable Schedule types, you are allowed to define the percentage for the first period, which is typically less than 100%. If you pick Type = Fixed Schedule, the Schedule section is automatically populated for you with as many rows as you specified in Number of Periods, and the percentage will be evenly spread across all periods to sum up to 100%. If you pick Type = Variable Schedule, you do not need to enter any details in the Schedule Section. However, if you want to recognize a specific percentage of revenue in the first period, you can enter Percent details for Period 1. The remaining percentage will be spread across the remaining periods you specify during transaction data entry. Really Nice and Interesting Blog Post! we share the information to all. Anyway, Thanks deferred revenue accounting . Thanks for the information, we will add this story to our blog, as we have a audience in this sector that loves reading like this deferred revenue accounting . I am a frequent follower of your Blog!! Exspecially this is one our best blog post.. Thank you..